In 2016, employment in the United States by U.S. parents was almost unchanged at 28 million workers. 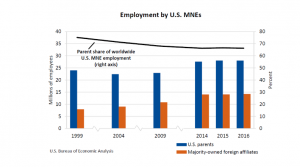 Whereas, U.S. parents accounted for 66.3 percent of worldwide employment by U.S. MNEs, decreasing 0.3 percentage points from 2015. Employment abroad by majority-owned foreign affiliates (MOFAs) of U.S. MNEs increased 1.2 percent to 14.3 million workers and accounted for 33.7 percent of employment by U.S. MNEs worldwide. The total private industry employment in the United States, was accounted for by 22.3 percent of U.S. parents. Employment by U.S. parents was largest in manufacturing and retail trade. While, employment abroad by MOFAs was largest in China, the United Kingdom, Mexico, India and Canada. With respect to the activities of U.S. MNEs, worldwide current-dollar value added decreased 1.5 percent to $5.2 trillion. Value added by U.S. parents, was almost unchanged at $3.9 trillion, representing 24.2 percent of total U.S. private industry value added. MOFA value added decreased to $1.3 trillion. The largest value added by MOFAs was in the United Kingdom, Canada, and Ireland. Worldwide expenditures for property, plant, and equipment of U.S. MNEs decreased 7.6 percent to $856.9 billion. Expenditures by U.S. parents accounted for $657.5 billion and MOFA expenditures for $199.5 billion. 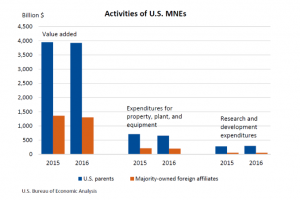 While, worldwide research and development expenditures of U.S. MNEs increased 4.9 percent to $350.3 billion. U.S. parents accounted for expenditures of $296.9 billion and MOFAs for $53.5 billion.